Do you struggle like myself styling a tiered tray? I don’t know what it is that stumps me. Is it the multi levels? The height between each tier? Or just picking out the decor for a small space? Whatever the case, I have decided to give it shot and share my struggle with you. 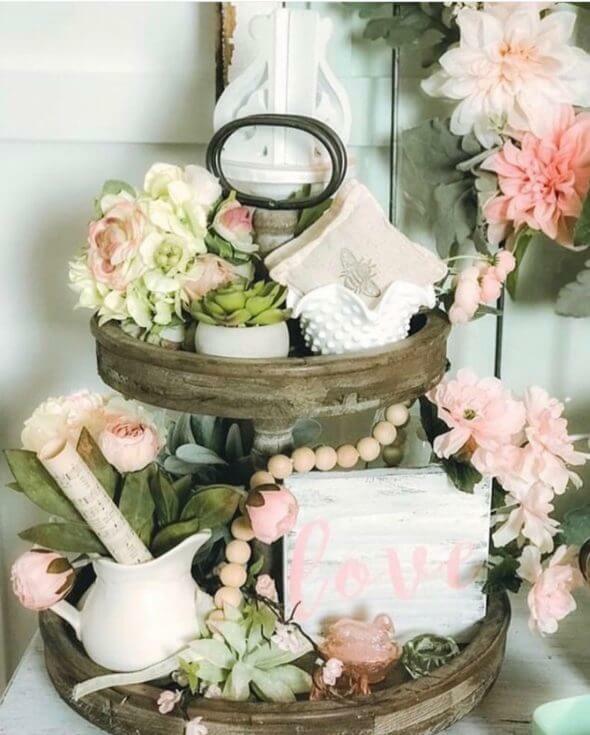 This challenge for attempting a decorated tiered tray came from Roz Here is her lovely decorated Valentines Tiered Tray. To create mine, I first went to Pinterest to get some inspiration. Do you do that? Hmm… that gave me some ideas but mainly helped me decide where the best use of this tray would work in my home. If I am going to spend time decorating it, it might as well be a functional piece of decor. Once you have decided its function, gather the items that would be useful on the tray. I decided the function would be to corral my bathroom items in a pretty, decorative way. Thus, I had to find containers for my items. I don’t know the significance of it but it was a piece he treasured and I made sure I hung on to it. Plus, I love how dainty it is and the pink just melts my heart. It makes me smile every time I look at it. These crystal pieces are already in use in my bathroom and therefore I just transferred them to the tray. As fillers I gathered items in the respective color palette. Mini succulents, votive candle, tea towel, mini desert stand and a few hydrangeas. Arranged them throughout the tray and voila, it’s complete. By the way: I would love to see what you created. Please share in the comments below. This is such a pretty idea, I love your styling of the trays. 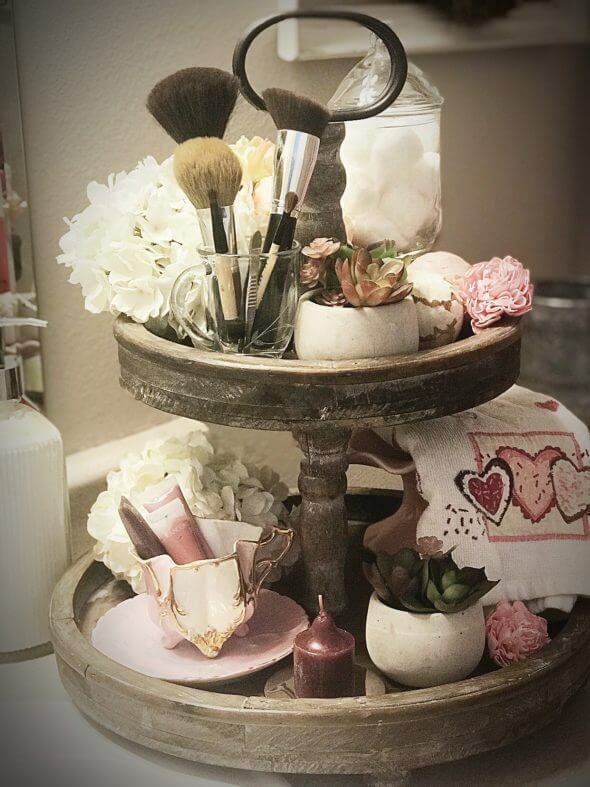 Visiting from Bloggers Pit Stop~I love your tiered tray, it is so cute!! They have really become popular over the last few years! I would love to have you visit and share on my Friday Feature Linky Party. Have a great weekend! Love seeing all the great posts! 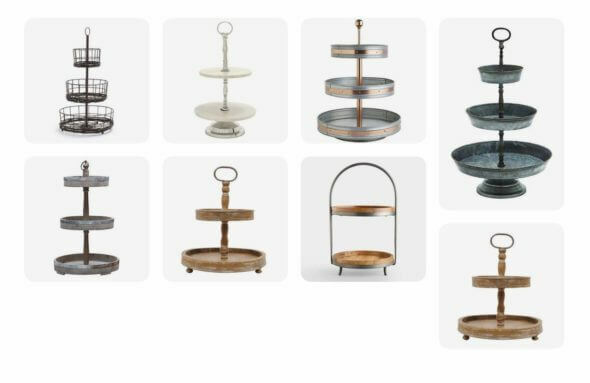 I love tiered trays. And I agree with you, sometimes it is difficult to decide where to place them and what to put in them as decor. I love what you did with yours. It is gorgeous and very girly. Love it. Thank you for sharing with #OMHGWW. See you next week.